Got a question about a dashcam? Want to know how much shipping will cost (hint: all dashcams ship for free in the US!) or how long shipping will take? You've come to the right place! We've split the frequently asked questions into four categories: Basic Dashcam Questions, Orders & Shipping, Warranty & Returns, and BlackVue-Specific questions. Click on any question below to jump to the answer of that question. For even more dashcam information, please also see our Dashcam Buyer's Guide and Dashcam How-To Guides. Visual learner? We've put this basic dashcam information from the questions below into a handy Dashcam 101 Infographic, for your viewing pleasure! Is it legal to use a dashcam? Tell me more about the videos I record with my dashcam. What/Where is my tracking number? Is the (dashcam/accessory/etc) in stock? Why buy from The Dashcam Store™? What is the warranty for your dashcams? Tell me about your Hassle-Free returns policy? The memory card inside my brand new BlackVue is empty! Can I format the memory card inside my BlackVue Dashcam? My BlackVue is warm to the touch, is this normal? What is the BlackVue operating temperature range? I can't connect to my BlackVue from the app? The frame rate when watching the live view (over WiFi) on my phone doesn't seem as smooth as when I watch them later on my computer, what gives? I've captured something cool/interesting/amazing/funny on video, what do I do now? How do I copy a video from the BlackVue to my phone? What is the correct way to connect the power and video cables to a 2CH BlackVue? The rear camera image has a green tint or the video is all green! In general, what configuration settings do you recommend modifying? The memory card is not recognized by my Mac! Simply put, a Dashcam (or dash cam) is a small video camera that attaches to your car's windshield and continuously records video as you drive. Dashcams were popularized in Russia; more than likely you have seen footage from a Russian dashboard camera. Sometimes a dashcam is called a car DVR (Digital Video Recorder), a car black box or an in-car camera system. Dashcams, or dashboard video cameras, got their name due to originally being mounted on the dashboard of vehicles (mostly police cars). Now, most dashcams mount to a car's windshield with a secure and easy to use suction cup mount or strong adhesive pad. Single-lens dashcams are the most basic type of dashcam. These record from a single camera lens, like a normal camcorder. Typically people mount these dashcams in their front windshield in order to record what is happening in front of the car. Dual-lens dashcams are a bit more complex. These dashcams can record from more than one camera lens at a time. Typically they utilize one forward-facing lens to record what is happening in front of the vehicle, and one inside-facing lens to record what is happening inside the vehicle. These are particularly useful for fleet or commercial vehicles where typically the driver of the vehicle is not the owner of the vehicle. There are also dual-lens dashcams for front + rear such as the BlackVue DR750S-2CH that record in front of the vehicle like a single-lens model, but also use the input from a smaller remote camera (a camera mounted in the back of the vehicle - on the rear windshield) to record what is happening behind the vehicle as well. Rear-view mirror style dashcams are a special type of dashcam. These clip securely to the back of your existing rear-view mirror, and provide video from a small forward-facing lens. This style of dashcam is great for those wanting a less-conspicuous solution. Professional dashcams are commercial-grade models designed for business use (fleet vehicles, taxis/Uber/Lyft drivers, delivery trucks, etc) or other commercial, municipal or government purposes. These high-reliability units are also desirable to those individuals seeking the added peace of mind that comes from using a professional-level device in their own vehicle. Unfortunately this is not an easy question to answer. Since dashcams all have different qualities, the best dashcam is the one that suits *you* best. The Dashcam Store™ has created a Buyer's Guide to help you get started picking out the right dashcam for your needs. Keep in mind that while there are a wide variety of dashcams available on the internet, many of which are cheap and unreliable, you can rest assured that we only sell those cameras which we personally research and which pass our own internal quality tests. Done! Since recording is automatic, just drive your vehicle like you normally would, and enjoy the fact that you are now "protected by dashcam"! See more on our How-Tos page. Dashcams have many applications, but most importantly, they act as an impartial witness in case of an accident. Sadly, there are dishonest people in the world, and a dashcam provides irrefutable evidence of what happened before, during, and after an incident. No more "your word against theirs" - rest assured you will always have the truth on your side. Many dashcam models provide GPS data logging as well. These camera units, along with the video, will provide a record of your position and speed at all times. This information, again, proves the facts such as your whereabouts at a particular time, and can also be used to prove (or perhaps more importantly: disprove) your speed. This GPS data can be overlaid on a Google-type map during video playback on your home computer. You have undoubtedly watched footage recorded on a dashcam at some point on the news or on the internet. Remember the Russian meteorite event? Since dashcams are always recording, they capture amazing, interesting, or even just plain funny events that occur every day around the world. Check out our videos page for examples. Dashcam footage can help others as well. If you capture an accident on film, it is almost certain that the other drivers will be happy to know you (and your dashcam) were there as witness. We've seen plenty of clips like this on YouTube, including some hit-and-run incidents where only the dashcam saw what really occurred, and the innocent victim would be left to pay the bill if not for the license plate captured by someone else's dashcam. Yes! Many dashcam models provide GPS data logging as well. These camera units, along with the video, will provide a record of your position and speed at all times. This information, again, proves the facts such as your whereabouts at a particular time, and can also be used to prove (or perhaps more importantly: disprove) your speed. This GPS data can be overlaid on a Google-type map during video playback on your home computer. You can't explain that! Just kidding. Dashcams record video to a removable memory card inside the camera itself. Any time your car is on and the dashcam is plugged in, it is acting as your backup witness. Dashcams automatically start recording when they are powered on, and stop recording once you turn your car off. Note: Some dashcam models have the ability to keep recording even while the vehicle is parked! This is known as "parking mode". * The DashCam Store does not offer this advice as legal council; it is only our opinion (as we are not lawyers). All dashcams come with a power cord that plugs into the 12v cigarette lighter outlet in your car. Plug this cord in, and you are up and running! This cord is usually quite long, long enough to tuck behind and route around the interior panels of your vehicle (on the way to the power outlet) so it will not be visible to the driver or passengers. Optionally, you or your local car audio shop can easily install or "hard-wire" the dashcam by tapping into your vehicle's 12v power circuit. This provides a complete professional installation and frees up your power outlet for your cell phone charger or other electronic device. We sell our own patent-pending installation kits that include simple instructions for quickly plugging in to your car's fuse box. Check out our dashcam accessories page for more information. Furthermore, typically dashcams include a small built-in battery. This battery isn't meant to power the camera for long periods of time, but is there in case power from the car is severed during an accident. The internal battery ensures the camera will keep recording even after a major accident. A dashcam starts creating video files on an empty memory card. These video files are typically segmented into 1, 3, or 5 minute chunks, since it is easier to view and work with small video files on your computer rather than one long continuous file. When the memory card is full, the dashcam simply starts over at the beginning of the memory card, and in this way, never needs any attention from you until you have captured an incident on video that you would like to save. This is known as "loop recording", and is one of the most important abilities of dashcams. Glad you asked! The Dashcam Store™ now has a Video Bounty program where you can earn cash for your footage! If you happen to capture something amazing on dashcam, and you own the rights to the video (meaning, you recorded the incident yourself on your own Dashcam), you can upload the clip using our easy drag-and-drop video upload page. If the clip is interesting enough, and we use it for any reason (such as promotional or educational purposes), we will pay you! We are located in Austin, Texas, United States of America, and all cameras and accessories ship from this central location. Telephone, live chat, and e-mail support all occurs at our headquarters in Austin, as well. No outsourced support here. We're proud to be American! For our US customers (all 50 states), we always offer FREE shipping via either USPS Priority, FedEx, or UPS ground on ALL dashcams AND on orders totaling more than $49.99. You may choose expedited shipping (e.g. 2-Day, or Overnight) during checkout for an additional fee (those additional shipping options and their associated costs may be viewed during the checkout procedure). For orders totaling less than $49.99, the available shipping options and exact shipping costs may be calculated and viewed during the checkout process (after entering your address). We do ship to PO boxes, and for our customers in the armed forces (thank you for your service! ), we also ship to APO and DPO addresses via USPS. For international orders, the same is true: the available shipping options to your country and exact shipping costs may be calculated and viewed during the checkout process (after entering your address). Our shipping department carefully packages and ships all orders placed during the work week within 24 hours. Orders placed before 12pm CST will ship the same business day, and orders placed after 12pm CST or during the weekend (Saturday or Sunday) will ship out the next non-holiday business day (Monday), at the latest. Often our crack shipping team will have your package ready to go sooner! We know you're excited to receive your new dashcam, and we do our best to get your box in the mail as soon as possible. Since we're centrally located in Texas, shipping to virtually anywhere in the United States typically only takes 2 to 3 business days, unless you have opted for an expedited shipping method, in which case you will receive your package even faster. Yes! We can ship to virtually any address in the world, although we cannot offer refunds or accept returns on items shipped internationally. Please note some products cannot be shipped to international destinations. If the product shipment is restricted, it will be stated clearly on that product page. You will receive an e-mail containing carrier and tracking number as soon as your item is packaged up for shipment. Please note tracking numbers may sometimes take up 24-48 hours to update on the couriers' websites once the shipment has been created by our system and/or picked up by the shipping carrier (especially during the weekend). You may also log in to your account to view the order status and tracking information at any time. Our website accurately reflects the status of our inventory, so if you can add an item to your shopping cart, it's in stock! However, we also accept pre-orders of items that are out of stock or coming soon, but that is clearly stated on the product page if that is the case. Items that are out of stock (and do not have an estimated back-in-stock date) will clearly state they are "Out of Stock" and you will not be able to add those items to your shopping cart. While we may not be able to compete directly with some of the prices you may see on Amazon or other online marketplaces, we do offer two things that the direct from overseas sellers and most vendors on Amazon cannot: knowledge and customer service. Have you had a chance to check out all of our extensive learning resources and how-to guides? What about our installation photo galleries? We're much more than just a simple retailer with a website, we want to educate and help you as well! Don't want to wait 2-4 weeks for your order? All of our merchandise ships from Texas, so you can expect delivery in 1-4 business days, coast to coast. Have a return or want to exchange the camera? No problem, let us know and we'll have you squared away in under a week. We've heard the horror stories of trying to get a refund or exchange from an overseas vendor. Worried about online ordering from an unknown source? Have a technical support question? We're only a phone call or live chat away. We hope by now you can see the value in dealing with a US-based company. Only orders with shipping addresses inside the state of Texas are subject to sales tax (8.25%). All dashboard video cameras (dashcams) sold from The Dashcam Store™ come with a 1 year warranty. This warranty is to cover manufacturer defects and does not apply to mistreatment or mishandling of the dashcam. We stand behind the products we sell, but please understand that as a small business we can't afford to replace items either intentionally or accidentally damaged by improper usage. All accessories sold from The Dashcam Store™ come with a 90 day warranty. Again, this warranty is to cover manufacturer defects and does not apply to mistreatment or mishandling of the dashcam accessory. If you experience a problem with an item you ordered, please contact us before initiating your return. Often, a simple settings change or battery charge will alleviate the problem. Defective items will be replaced at our cost within the manufacturer's warranty period, or 360 days of the order date, whichever is longer, if the issue cannot be otherwise resolved. You should expect to receive your refund within 20 days of giving your package to the return shipper, however, in most cases you will receive a refund more quickly. This time period includes the transit time for us to receive your return from the shipper (3 to 5 business days), the time it takes us to process your return once we receive it (1 to 2 business days), and the time it takes your bank to process our refund request (2 to 10 business days). Sorry, but at this time we cannot offer exchanges, returns, or refunds on international sales. If you need to return an item, simply login to your account, view the order using the "Complete Orders" link under the My Account menu and click the Return Item(s) button. We'll notify you via e-mail of your RMA number and return instructions, and then later of your refund details once we've received and processed the returned item. We don't play games and delay your refund, or force you to decorate all sides of the return box with your RMA number like some vendors do. Not all sales work out, we realize this and we won't guilt trip or hassle you for it, we promise. We want you to be happy whether you keep our dashcam or not! What is the default BlackVue WiFi password? The default password to connect to the DR500, DR550, DR600, DR650GW, DR650S, or DR750LW is simply: blackvue. It's a good idea to change the default password so no one else can access your Dashcam videos or settings. The default password to connect to the newer DR590W or DR750S models is unique for each individual camera, and the unique password can be found on the serial number label that is located on the camera body itself. You'll need to remove the camera from the mount in order to find the WiFi password on the 590W, 750S, or 900S BlackVue models. I changed the WiFi password and now I can't connect to my BlackVue? Easy fix: you can use the BlackVue Windows or Mac viewer software to set a new WiFi password. To do this, remove the memory card from the camera and insert it into your computer. On the memory card, inside the "BlackVue" folder, look inside the "Application" folder. Go in to either the "Viewer for Windows" or "Viewer for Mac" folder, depending on your type of computer. Run the application, and click the "gear" icon at the top right to access the settings/config file. You can set a new WiFi password here. If you don't have the Application folder on your memory card, you can download the free BlackVue Viewer application for PC or Mac here: BlackVue downloads. Not to worry! All the BlackVue memory cards shipped with cameras are empty, this is normal. The first time the BlackVue dashcam is powered on, it actually copies the PC/Mac viewing software, configuration files, and other files/folders to the memory card. No matter what happens with the memory card, the software and files will always be restored to the memory card, from the camera. This will occur after reformatting the card, or inserting a brand new card into the BlackVue. Yes. To easily and quickly perform an in-dashcam format, with the DR600/650 powered on, simply hold down the Wi-Fi button for approximately 10 seconds. A beep will be heard from the BlackVue, and then a message "Formatting the SD Card...". After a few moments, another message will be heard indicating the BlackVue is rebooting. Once the unit reboots, it will resume normal operations. It's still a good idea to perform a full format of the memory card periodically (click here for the full-format procedure), especially if you begin having performance issues with the dashcam.. In most cases this issue may be resolved by performing an in-dashcam format as described in Question 4 above (restart the unit, then hold down the WiFi button for approx. 10 seconds until you hear a beep). If the message persists, we recommend using a computer (PC or Mac) to do a full format of the SD card as described in this procedure. The cause of needing to format the micro SD card occasionally is explained further on that page. Yep! A dashcam of this caliber is a pretty high-tech piece of equipment. When you think about it from an engineering perspective, capturing high quality full HD video takes a large amount of computer processing power. Until a few years ago, any camcorder recording in full HD at 30 frames per second would have been at least 5 times the size of these cameras. Add in all of the other bells and whistles (WiFi, GPS tracking, G-sensors, and more), and put them in a tiny package, and heat is the by-product of all that data processing that is going on. But not to worry. Earlier dashcam models from BlackVue did suffer some heat-related problems, but their engineering team took on those issues head first and resolved them before putting out the DR500 and DR550 (and subsequently the DR600 and DR650). That's the beauty of the iterative design process! The case of the Dashcam itself is actually used as a heat-sink (notice the nice vents you see along the top and bottom of these models), so that's why you may notice it is warm or hot to the touch. Don't worry, this is normal, and your BlackVue is operating as designed. The BlackVue published temperature range is either -4° to 140° F (-20° to 60° C) or -4° to 158° F (-20° to 70° C), depending on the model. Check your user manual for your particular model's operating temperature. Those are operating temperatures, so most likely the camera will be fine even above and below that range when turned off (such as overnight or parked during the day). Ensure the BlackVue Wi-Fi hotspot has been turned on (press the Wi-Fi button on the side of the Dashcam), and that the Wi-Fi light has changed from blinking to solid. One common problem is that your phone/tablet/laptop is already connected to another WiFi network, such as your home or work hotspot. You may need to have your device temporarily disconnect or "forget" your known network in order to then connect to the BlackVue dashcam WiFi. It may also help to connect to the BlackVue hotspot directly from your device's Wi-Fi settings menu, then returning to the BlackVue app and proceeding as usual. In rare cases when this is not the problem but the app still won't connect, we've had customers who uninstalled the app, and then download the latest version from the Play or App store in order to restore their ability to connect with their BlackVue. It may also help to power cycle (reboot) the BlackVue prior to attempting to connect via Wi-Fi. This was an extremely rare issue we saw that was easily resolved by cycling power to the unit. To do this, find a safe place to park your vehicle, disconnect the power cord from the camera body, wait 30 seconds, and plug the power cord back in. Alternatively, you may press and hold the WiFi button on the side of the dashcam for 7 seconds, which will reboot the device. This is normal. The frame rate output over WiFi is reduced somewhat from the full HD for several reasons. For one, this is done in order to work with a variety of phone types, not all of which are able to render HD video at full frame rate. Another reason is that while the BlackVue is streaming the stored video to your phone, it's also still recording video at the same time. Rather than compromise the recording quality of the current video by the demands of also transmitting/displaying full HD video, the transmitted video is just sent out at slightly lower quality. Full resolution is always still available of course by copying the video to your computer. We've found it can take anywhere from 12-24 hours for the GPS time signal and time zone settings to sync up after changing the time zone setting. Just make sure your time zone is set correctly, then drive like usual and it should eventually display correctly on the live view and recorded videos. First of all, don't do anything except concentrate on driving! As long as you take action relatively soon (within a few hours to be safe), your video will be safe from being overwritten while you find a safe place to pull over, or until you reach your destination. Then, when you are safely off the road, you have two options: 1) use the smartphone app to copy the video to your cell phone, or 2) take the microSD card to a computer where the video can be copied over directly. If you want to use the app to copy the video to your phone for backup purposes, connect to the BlackVue via Wi-Fi, then simply locate the video in the list, and long-press on the video. A menu will pop up after a few seconds, then you can select "Copy to internal storage" or if your phone has a removable memory card you can also select "Copy to external storage". Once the video is on your phone (transfer can take anywhere from 30 seconds to a minute), you may upload the video directly to YouTube! What is the correct way to connect the power and video cables to the DR650GW-2CH, DR650S-2CH, or DR750S-2CH? Please see the following image for correct cable insertion locations. 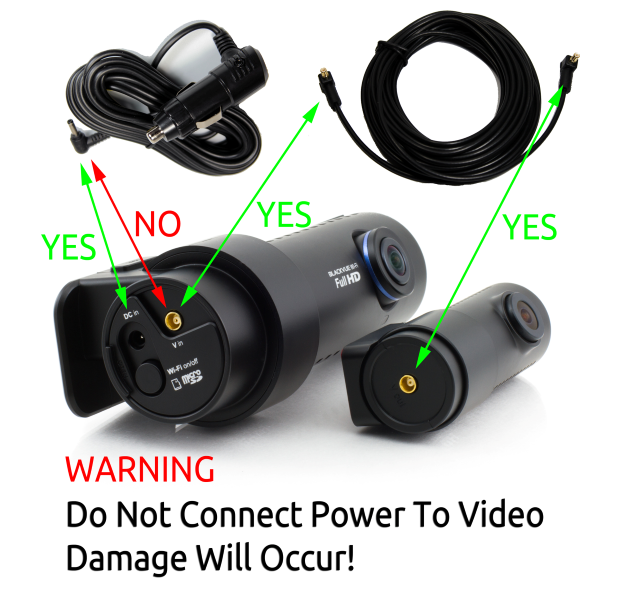 Please note incorrect connection can cause damage to the Dashcam unit that is not covered by warranty! We're not sure what causes this occasional glitch but in almost every case this is resolved by power cycling the BlackVue. The default settings are pretty spot-on for most situations and users. However, if you are using a Power Magic Pro to keep your BlackVue on when your vehicle is parked (a.k.a. "Parking Mode"), we recommend reducing the motion detection setting significantly; motion detection is very sensitive and may be activated by even trees swaying in a slight breeze. A setting of less than 10 will help prevent excessive recordings in Parking Mode. Now you can put the card back in the BlackVue, it will re-initialize and start recording like usual. From this point on, when you put the BlackVue memory card back in your Mac, it will be recognized and you can view the recordings or run the BlackVue viewer software without issue. Yes, please see our BlackVue, Thinkware, Garmin, and other brands of user manuals in PDF format here dashcam user manuals (click here).